There is a feeling inside my heart that tells me 2016 is going to be a GREAT year! New year resolution's are not really my thing, but this time was different. Twenty-sixteen brought a rush of peace and calm to my life in a very real and dramatic way. The older I get, the more excited I become to set goals and make commitments each new year. This year my list was long, long, longggg! It's a hard reality that basically everything in my life needs to improve and that's 100% okay. The resolution concept that really stuck with me was "word of the year" and I decided that would be a perfect way to focus on improvement instead of perfection. 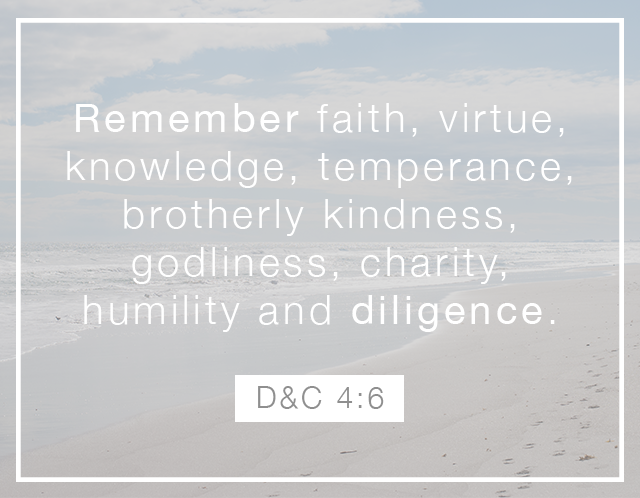 My word of the year - diligence. It was necessary to find the right word.... I mean, a whole year! 1. constant and earnest effort to accomplish what is undertaken; persistent exertion of body or mind. 2. Law. the degree of car and caution required by the circumstances of a person. Isn't that just spot on? There is a lot to be undertaken and it will require me to be constant and earnest with care and caution. But, it's going to be exciting and progress is all that matters. With it only being the 2nd week of January, my commitments are 100% so far and my efforts are 105%. Not every day has been perfect, but by "small and simple things are great things brought to pass" (Alma 37:6). Every day has been a little better than the day before and even more importantly, my attitude has been better than the day before. Best of luck with your own goals & commitments. We've got this!